Every year we plant a large backyard garden and I always look forward to home canning and/or freezing part of our harvest for late use during the cold wintertime months. 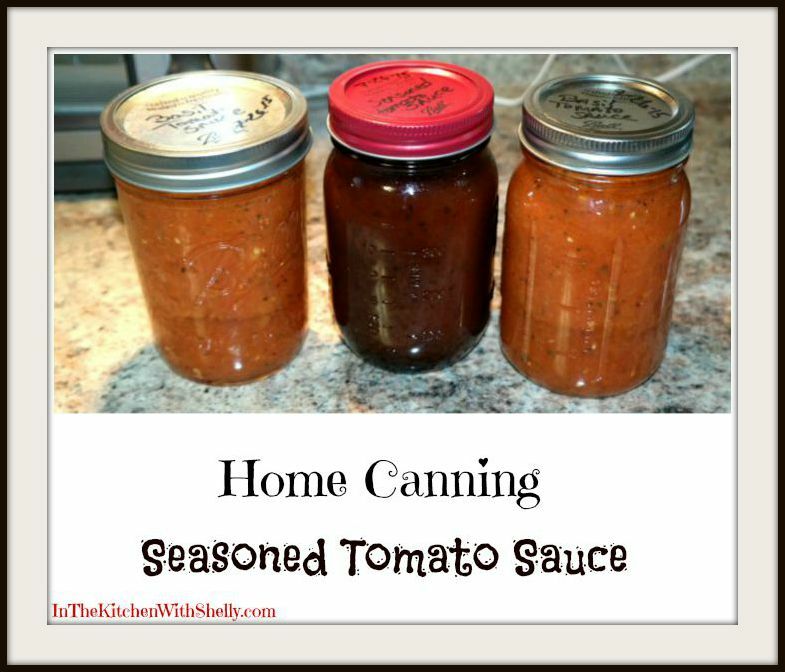 This year our tomatoes have been doing exceptionally well and I've been canning a lot of tomato sauces and other tomato products. When I make homemade seasoned tomato sauce I always follow the recipe in the Ball Blue Book - Guide to Preserving on page 33. It's the most versatile tomato sauce recipe and can be used in any recipe that calls for seasoned tomato sauce. I like using it in my meatloaf, chili, spaghetti, vegetable soups, etc. 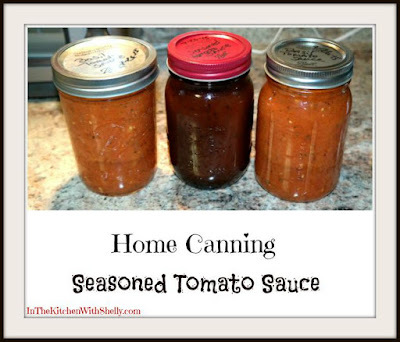 Here is their recipe that I always use when I am canning homemade tomato sauce. * Recipe is courtesy of Ball Blue Book. It will make about 14 pint jars or 7 quart jars of sauce. Prep: Wash tomatoes under cold running water, drain. Remove core and blossom ends. Cut tomatoes into quarters. Peel onions, chop onions. Peel garlic and mince. Cook: Saute onion & garlic in olive oil in a large saucepan. Add tomatoes, oregano, bay leaves, black pepper & sugar. Stir in salt and crushed red pepper. Simmer 20 minutes, stirring occasionally. Remove bay leaves. Puree tomato mixture using an electric food strainer or food mill to remove peels and seeds. Return puree to saucepan. Cook puree, uncovered over medium-high heat until puree thickens, stirring to prevent sticking. Cook until volume is reduced by one-half. Fill: Add 1/4 teaspoon citric acid or 1 tbsp. bottled lemon juice to a hot pint jar, 1/2 tsp. citric acid or 2 tbsp. bottled lemon juice to a hot quart jar. Ladle hot sauce into jar, leaving 1/2" headspace. Remove air bubbles. Clean jar rim, center lid on jar and adjust band to finger-tip tight. Place jar on the rack elevated over simmering water (180 degrees F) in boiling water canner. Repeat until all jars are filled. Process: Lower the rack into the simmering water. The water must cover the jars by 1". Adjust heat to medium-high, cover canner and bring water to a full boil. Process pint jars for 35 minutes or quart jars for 40 minutes. Turn off heat and remove cover. Let jars cool for 5 minutes. Remove jars from canner, do not retighten bands if loose. Cool for 12 hours. Test seals, label and store jars. Please Note: I used the following product to puree my tomatoes. The blender does a great job! Recently we received the Tribest’s Dynablend® Horsepower Plus™ Blender to review and have been using it non-stop ever since! As a foodie, I have owned numerous blenders over the years but this one has quickly become my favorite one! It's the most powerful home blender with a solid glass pitcher and stainless steel scoop (that easily breaks down firm materials). In addition, it's completely BPA-Free! It's really easy to use, super simple to clean. You can buy this beautiful machine at Amazon.com or at TribestLife.com. Over the next several weeks I will be featuring numerous recipes and photographs here on my blog utilizing the Tribest’s Dynablend® Horsepower Plus™ Blender so that all of you can see it in action! Disclosure: I received the Tribest’s Dynablend® Horsepower Plus™ Blender as a complimentary product to use and review here on my foodie blog. No compensation was received. I will be featuring the blender in various recipes here on my blog. My opinion about this blender is 100% my own experience with it. I think I would like to try to can some items. if I ever have a lot of tomatoes I shall remember this recipe as the one to read.